"Right, everybody, what's popular? We've done Ancient Rome, Ancient Egypt, Ancient Greece - what else can we do?" "Erm…..not sure, we're struggling a little bit…." "OK, close your eyes and pick a theme." I'm not suggesting that slot developer Microgaming are short of ideas, of course, but they've gone back to the tried and tested themes of ancient myths, powerful Gods and bronze shield-wielding heroes with this slot. 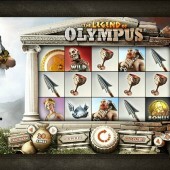 Developed in partnership with Rabcat, known for their expertise in making 3D games, The Legend of Olympus looks the biz. For fans of the ancient Greek-themed game, Cupid & Psyche, from leading developer Bally, or Microgaming's own take on the swords 'n' sandal '80s actioner, Clash of the Titans, Stash of the Titans (see what they did there?) there's plenty to enjoy here. If you're up on your mythological hard men, you'll know that Zeus was the king of the gods and Hades was the king of the underworld. The game sees those two giants go head-to-head on Mount Olympus in an epic battle for the fate of the world. On some slots reels. On the way there are gods a-plenty, lots of lovely animation, and some nice bonus rounds. The symbols in the 5 reel, 20 pay-line slot are all epic-related, and we have a bronze spear, a gold goblet, a winged helmet, a shield, plus the gods Ares, Aphrodite, Poseidon and Hades are all present and correct. Hades himself acts as the game's Wild and substitutes for all symbols including the Zeus symbol and the gold coin symbol. Zeus triggers the free spins when three or more appear across the reels. The animation team's hard work kicks in as Zeus tosses a few lightning bolts in the general direction of Hades, each time revealing a different number of free spins. Once Hades has departed the screen you can take your free spins, and even better - the spins can be re-triggered. The gold coin symbol triggers the Styx bonus round when three of them appear on the reels. Click on the spinning gold coins and reveal two or more gold coins (avoiding silver coins) and you'll be able to travel the river Styx, gateway to Hades' cosy pad in the Underworld. If you manage to get over the river Styx you will have a series of treasure chests to pick from. Each one contains a different cash prize, so pick carefully. 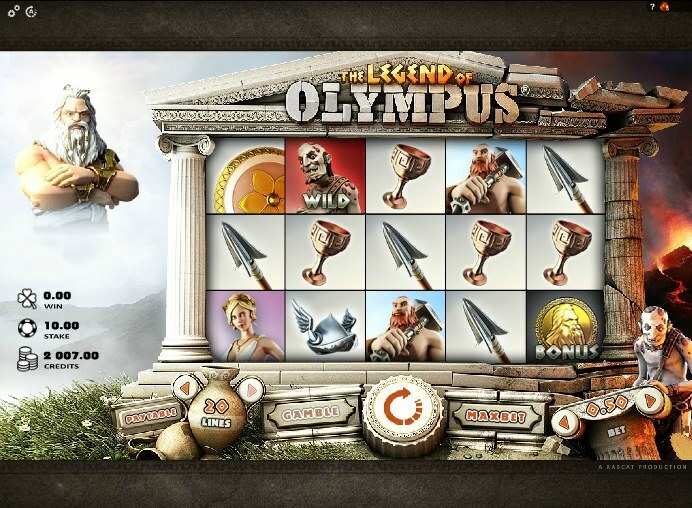 While the animation and gameplay of The Legend of Olympus are what you'd expect from a decent slots developer these days, that doesn't take away the effort that Microgaming have gone to in making this slot. There's plenty for fans of mythology, the betting is friendly - starting at $0.01 - and the bonus rounds are nice enough. All in all, it's a worthy addition to the genre.